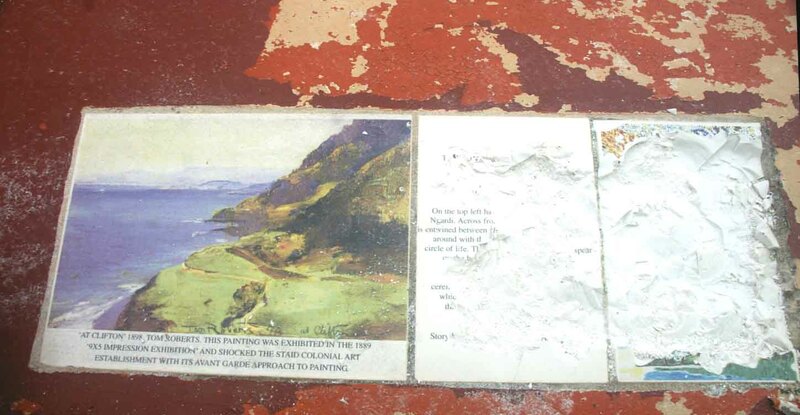 One of the vandalised plaques. 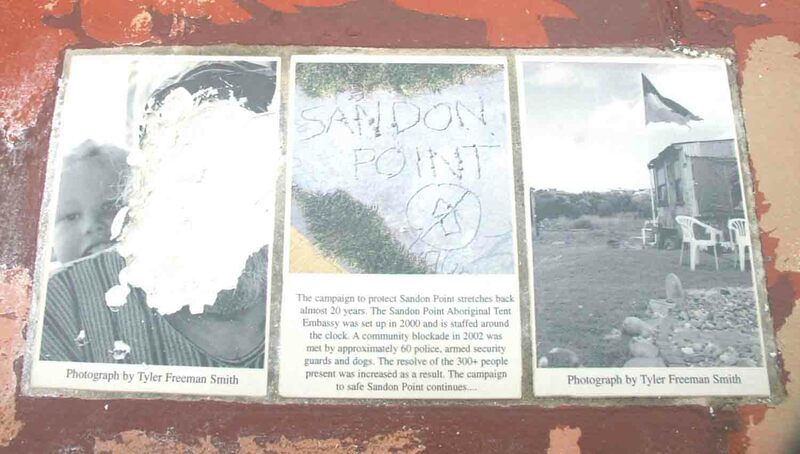 The vandals seem to indicate that the plaque should be located at Sandon Point, Bulli, rather than at Collins Point, Woonona. COMMUNITY condemnation has been expressed at what some consider is racially motivated vandalism of historical plaques at Collins Point, Woonona. Environmentalist Marcel Van Wijk said the vandalism was discovered today while monitoring the effects of the big seas and tides on foreshore areas at Woonona, Bulli, Sandon Point and McCauley’s beaches. Mr Van Wijk said he was taking pictures of the areas for comparison, in context of Wollongong City Council’s preparation of a dune management plan and the ongoing debate regarding the planting of coastal wattle on local beaches and dunes. When reaching the bathers pavilion at Collins Rock, Mr Van Wijk and Council staff found that two plaques depicting indigenous heritage, near the monument commemorating Captain James Cook’s attempted landing near Bulli beach, had been vandalised. The other vandalised plaque at Collins Point Woonona. Mr Van Wijk a witness, an elderly woman, saw a man smash into the plaques with a hammer earlier that morning. He said the only plaques that had been defaced were two, entitled, “Kuradji Dreaming”. “Both plaques are located quite well apart from each other and are separated by many others in between, so (it) appears as though there was a definite target,” he said. Have people nothing better to do? This is disgusting.. I hope they are caught!